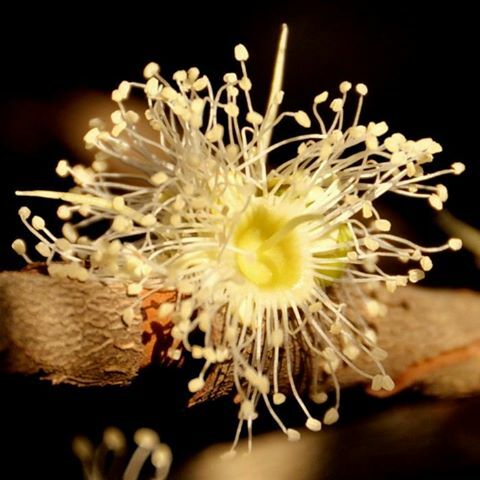 Countless indigenous fruits belonging to the family Myrtaceae from Brazil bear edible fruits, and several of them have already been introduced among tropical fruit growers around the world. 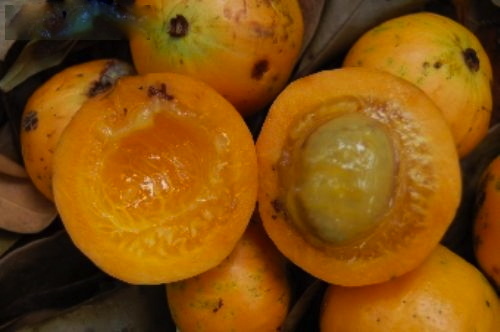 Examples are the Guava (Psidium guajava), the Cattley or Strawberry Guava (Psidium cattleianum), the Jaboticaba (Myrciaria jaboticaba and its close allies), the Yellow Jaboticaba (Myrciaria glazioviana), the Feijoa (Acca sellowiana), the Pitanga (Eugenia uniflora), the Grumichama (Eugenia brasiliensis), the Pitomba (Eugenia luschnathiana), the Rio Grande Cherry (Eugenia involucrata) and more recently (Morschbacker, 1994) the Cambucá (Plinia edulis). The aim of this article is to draw attention to the Cambuci (Campomanesia phaea), a fascinating, barely known (even among Brazilian horticulturists!) Myrtaceous fruit with great economical potential, to the horticultural world outside of Brazil. 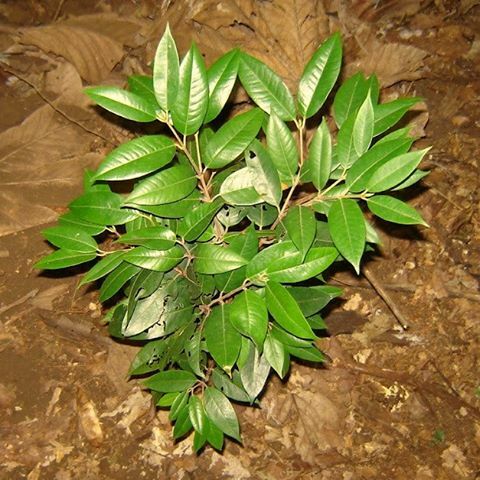 Cambucá is a very slow growing, evergreen tree, reaching usually from 5 to 12 m high. The short trunk (30% of the total height), 30 to 50 cm in diameter, has a wide and dense crown of slender, spreading branches. As many other plants from its family, it has a smooth, thin, pale brownish-gray outer bark easily pealed off in large flakes to show the coppery layer below. On the short (0.5-1.5 cm), finely hairy, petioles there are evergreen, opposite, elliptic-acuminate, leathery, glossy, curled margin leaves, 5-16 cm long, 3-5 cm wide, glabrous, dark green above and slightly downy, light green below. The round flower buds are 0.3 cm in size. The sessile, white flowers, with a cluster of numerous stamens 1.0 cm long, are born agglomerated in groups (2-8 flowers) over the branches axils or distributed around the stem. The very smooth, short stalked, globular berry is larger than most Myrciaria and Eugenia. 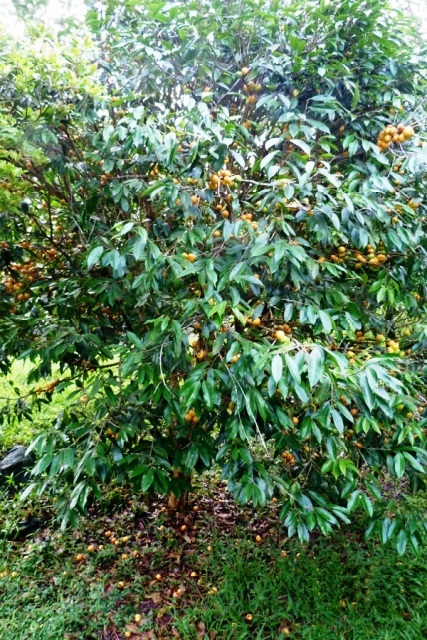 They are green at the beginning, turning yellow to bright orange-yellow when ripen, presenting many slightly raised longitudinal ridges. Some old books mention about the existence of fruits up to 9 cm large, but the trees that I know produce smaller fruits. Their size ranges from 5.0 to 7.0 cm in diameter and 4.2 to 5.5 cm in height and their weight from 55 to 140 g. Under the leathery, thin skin, there is a soft, grainless, juicy, orange-yellow, 0.4 to 0.7 cm thick flesh, similar to Peaches in texture. It involves an incredibly delicious, translucent, melting, yellow, 0.5 to 0.8 cm thick pulp that encloses one or rarely (5%) two hard, oblong, flattened, light purple seeds, easily separable from the pulp. Both, flesh and pulp, have a delicious, well balanced subacid to sweet flavor, resembling jaboticabas, grumichamas and pitombas, but without any trace of astringency or resinous aftertaste. 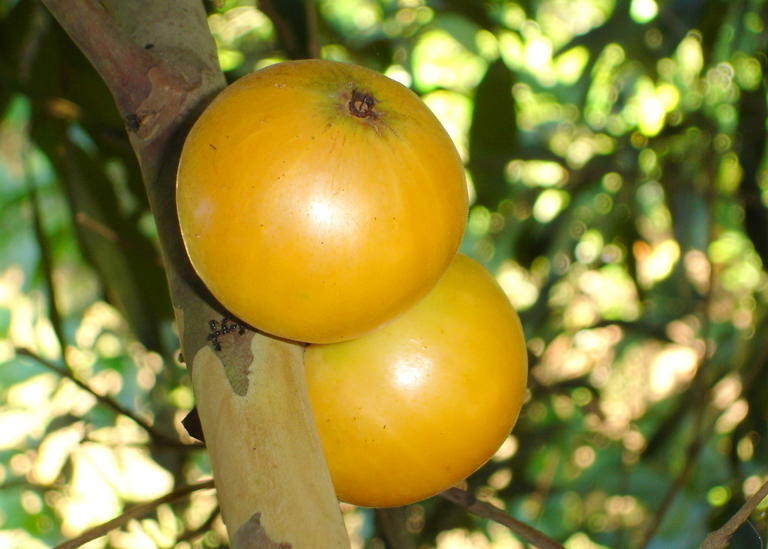 The Flying Saucer Fruit is native to Southeastern Brazil, in the States of São Paulo, Minas Gerais and Rio de Janeiro. It thrives from Serra do Mar mountains to the lowlands, and in nature always associated with rainforests. The authors’ personal experience revealed that each particular climate and altitude leads to a distinct strain. By the way, the population of Salesópolis in São Paulo hills was raised to the category of botanic subspecies, receiving the name of var. Sub-Tropical Fruit Club of Qld. Inc Ph: 07 3103 0201 or 07 3289 4198 June – July 2012 Page 7 lauroana (Mattos, 1967). Cambuci has adapted to most regions in Brazil, and despite being a plant of subtropical origin,certain varieties could adapt well to more equatorial climates. The tree is very tough and can withstand light freezes inwinter to heat of 40 Celsius in summer. Dr. Leslie Landrum (pers. comm.) said that it would be a very desirable additionto American orchards. It wouldn’t be a difficult task to establish in States like Florida or California, as it proved to becold hardy. The Cambuci is propagated by seeds, which remain viable for up 6 weeks if kept in damp peat or sphagnum moss. If dried, they quickly lose their germination properties.Seeds should be best planted in the top of a tray filled with sand, covered with the minimum layer as possible, as their embryos are very sensitive. The addition of fungicide andbactericide is desirable, as well as placing the set in mist irrigation. At a temperature of 25 Celsius on average, they should germinate in 30-60 days period. Afterwards, the tiny seedlings should be transferred to a 1gallon pot with good organic, slightly acid soil. Slow release fertilizers are recommended. Planting in the field should be done only when the seedling is about 1 m high, in a sunny spot protected from the sun in the first weeks. In our estate the soil is very acid (pH 4.5), so we add limestone to raise pH till 6.5. In a pit of 60 cm x 60 cm x 60 cm, we add 10 liters of organic compost, plus 100 g phosphate, 100 g NPK 10-10-10, and a minoramount of trace elements. The growth rate is relatively fast, and in 3 to 5 years most trees start to bear fruit, that becomeheavier as the tree gets older. Fertilization should be done by splitting 500 to 800 g of NPK 10-10-10 plus 300 g of Potassium Chloride (or another K source) annually. With the addition of Potassium increases the sweetness of the fruits. In Rio de Janeiro, flowering begins in October, extending until the first week of December. The harvesting months are late February to April. Flying Saucer fruits should be picked up only after falling to the floor, when they become very soft, as unripe fruits usually are hard and astringent. At this point the skin changes from green to yellowish green color, with a translucent appearance. A crop of more than 400 berries per tree can be expected. As fruits are very soft and the skin thin, an immediate processing into pulp and freezing is advised for commercialization. Almost no pest or disease has been reported, as it is quite a resistant tree. Even Myrtaceae problems like rust disease or fruit fly never attack Cambuci. Only trouble ever seen by the authors was a fatality by fungus attack of the root system, when the cambucizeiro was planted in a soggy area. As previously informed in this paper, Cambucis are used to prepare a marvellous sorbet. To the pulp puree, a bit of egg white is added (to reduce tannins), plus sugar and water to taste. One of the best restaurants in São Paulo city, which belongs to a famous chef, serves this ice-cream as its foremost dessert. Other uses are a kind of marmalade that takes on a beautiful coppery-red color and perfect texture, in fresh juices and as an infusion in sugar cane spirit. A number of products like liqueurs, bonbons, ice coolers and mousses are prepared with the Flying Saucer Fruit. Some of them can be seen in the website of Cooper Cambucy, the fruit producers’ cooperative in Rio Grande da Serra,State of São Paulo. Despite its excellent attributes and ease of cultivation, the Cambuci was never introduced in cultivation outside its country of origin. Even serious recommendations like the article published in “Economic Botany” (Kawasaki & Landrum, 1997) failed in their purpose, most probably because of the lack of viable seeds. The challenge of starting its introduction into tropical fruit horticulture in America is still being posed to the most talented of its tropical fruit gardeners today.